This Mother’s Day, show your mom how much you care by getting her a box of Krispy Kreme’s flower-shaped doughnuts. That’s right! On its 75th birthday, Krispy Kreme honors every mom by releasing its first-ever flower-shaped doughnuts. Made especially for all mothers out there, these melt-in-your-mouth treats come in three fun and festive colors that are sure to bring a smile on everyone’s face—pink, yellow and white. 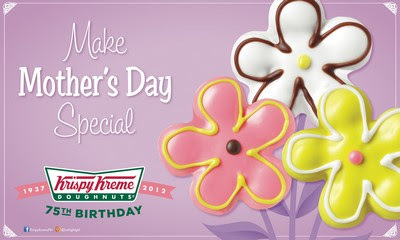 Krispy Kreme’s flower-shaped Mother’s Day doughnuts are only available from April 13 to May 31, 2012. So hurry and go to a store near you. Grab a bouquet before they wither away.